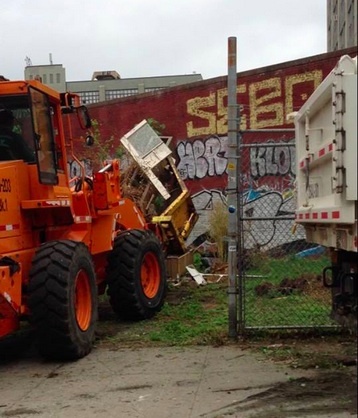 The City’s Department of Sanitation bulldozed the community garden at 99 South 5th Street, Brooklyn on May 23, 2013. Image Credit: Time’s Up. High rises are built in Williamsburg, Brooklyn at a historic rate and most of them remain empty while very few lots are preserved as open space. One such lot at 99 South 5th Street in Williamsburg is owned by Housing Preservation and Development (HPD), the City government agency charged with managing affordable housing, and has been vacant for at least 20 years. Last year HPD released a Request for Proposals (RFP) for the lot (alternate address 337 Berry Street), asking developers to submit plans to buy and develop the property. The results were supposed to be released to the public last November. While the RFP for this lot requested that at least part of the footprint be set aside for open space, the activists at Time’s Up know all too well how public space projects conveniently disappear from development plans when costs run higher than expected. Time’s Up, a direct action environmental group, has defended and supported open space in New York City for 20 years. After three years of operating a bicycle co-op in Williamsburg, the group has established deeps roots in the community. One of the volunteers proposed that Time’s Up finally start their own community garden in the neighborhood. The group decided on the 99 South 5th Street lot, just one block from their bicycle co-op, after scouting vacant lots around that location, researching who owned those lots, and holding several meetings to discuss the pros and cons of each. Time’s Up spoke with the community board and left messages for HPD to find out what happened with the RFP, but were told nothing. Additionally, hundreds of signatures were collected from local residents who supported the garden. For the past two months, a team of volunteers have converged on the vacant lot at 99 South 5th Street to begin establishing the community garden. Two women made compost bins, a large group constructed a stage out of donated recycled plastic lumber, four carpenters with power tools built eight raised beds, and various other volunteers weeded the flower beds and cut tall grass. “What’s the name?” one volunteer asked another as they stood outside the fence, staring in. “Nothing yet,” said the other. The No Trespassing signs were replaced with a colorful hand-painted sign reading, “If you would like to garden with us, contact NothingYetCommunityGarden@gmail.com.” There were two locks on the chain, one belonged to the City, and one belonged to the gardeners. In its aptly titled 2012 article, “Brooklyn Waits on Promise of a Park,” the Wall Street Journal reported that Williamsburg and Greenpoint do not have the amount of open space called for in the 2005 Greenpoint-Williamsburg Rezoning plan. The article pointed out that plans for a 28-acre park, connecting Williamsburg and Greenpoint with a path, waterfront views, and a playground, have yet to materialize. The City has failed to follow up on their plans to create desperately needed green spaces. In its statement of community needs, Community Board One in Williamsburg-Greenpoint notes that expanding parkland is a priority community need. The Williamsburg-Greenpoint Open Space Plan specifically concurs. On May 22, 2013 HPD announced that North Brooklyn Development Corporation had won the RFP and would be developing the lot this year. After finding out about the RFP announcement, Time’s Up volunteers were eager to talk to North Brooklyn Development Corporation and find out if they would permit the garden until development started, or even include a garden in the plans, since the RFP requires open space. Instead, the next day at 7:00 A.M., the City’s Department of Sanitation destroyed the raised beds, picnic tables, benches, and stage, and bulldozed the garden. Volunteers called HPD on the spot. When HPD finally returned their calls, they were told that the lot was actually not part of the RFP, still belonged to HPD, and would remain vacant. HPD came in without any warning, destroyed valuable materials that the organization can never get back, and reversed hundreds of hours of hard work put into cleaning and beautifying this lot. If they would have just given us a reasonable amount of time, we would have moved the raised beds, tables, benches, stage, and beehive to another location. Dozens of people approached the gardeners as the bulldozers demolished the lot, offering their condolences and support. “I’ve been watching you guys work on this from my office window, and it looked just great,” one person said. “It doesn’t make any sense, this lot was full of trash for 20 years and they never cleaned it up until you guys started gardening here.” If the garden had been destroyed by the developer who had bought the lot, the gardeners could have understood the impetus to clean the space, but we are all confused as to why the City spent its own money and resources destroying a project that had extensive community support and no complaints. Even though this garden was destroyed, at a huge loss of resources and volunteer efforts, Time’s Up will continue to struggle to create the open space that the community so desperately desires, both in this lot and others. – Keegan Stephan is the volunteer coordinator for Time’s Up.